2019's May election promises to be an especially interesting one for Oregon City. Four local school board members are stepping down, and all of those positions are being contested, with eight new names on the upcoming ballot to represent the school district serving the city and nearby unincorporated areas. Meanwhile, Clackamas River Water, the water district serving unincorporated areas just outside Oregon City that is overspending its construction budget by $6 million, has three contested races, each with two candidates going head-to-head. Plus, Chris Groener, who represents Oregon City on the Clackamas Community College Board, has two opponents in the upcoming election, H. J. Harrer and Paul A. DiMilla. On the other hand, outside of the Oregon City area, there are only two school board positions being contested in Gladstone and North Clackamas, one in each district. 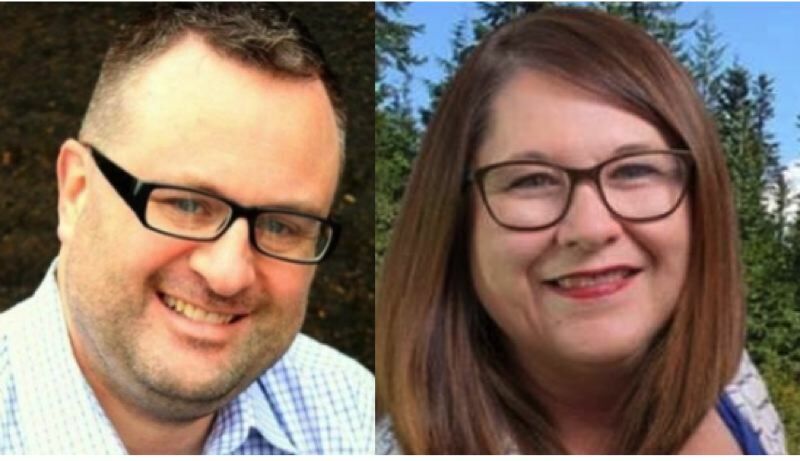 All of the positions for the Oak Lodge Water District and the Clackamas County Education Service District will be filled by candidates running unopposed. What is making for such an active election cycle in Oregon City this year? As previously reported, the OC School Board voted 3-2 on March 4 to appoint Brian Remsburg to a seat that was vacated just a few months before that seat was up for election. Then three of OC's current school board members decided not to run for another term, and starting July 1, Cameron Seward, Chris Storey and Nicole White will no longer be board members. One of the three OCSD board members who will continue to serve past this year, Martha Spiers, has endorsed a slate of four candidates who are on the May ballot. Spiers voted against appointing Remsberg to serve out the remaining three months of this year's vacated term and has instead recommended voters choose Steven Soll for the full term that will fill the seat for the next four years. Storey has endorsed a list of candidates in opposition to Spiers' recommendations, including for Position 6, which he is vacating, endorsing Scott Dahlman over Emma Lugo. For another contested school board seat, Spiers has endorsed Pamela White, who is the candidate running against Spiers' opponent in the 2017 election, Troy Bolinger. Spiers unseated Bolinger after he had served only one term during the last election cycle in 2017 with help from the Democratic Party, and 2019 promises to be another election cycle charged with partisan politics for the OC School Board. Spiers posted on Facebook last month her endorsement for a "great slate of progressives running in all four races" including Soll, Lugo, White and Anna Farmer. "Tell your Oregon City/Beavercreek/Redland/Jennings Lodge friends to turn out to vote in the May 21 special election, and let's get equity and inclusion in a position of top priority in our schools," Spiers wrote in the March 7 post, prior to Bolinger filing for the election. White said that Spiers encouraged her to run based on her experience in Oregon City for the past 10 years, including spending most of her free time attending OC Chamber events and volunteering for Clackamas Repertory Theatre where she is now board president. Bolinger shot back in an email interview with the OC News, misspelling Spiers' name on multiple occasions. "Spears (sic) is bad for OC kids and she is trying to get others like her to join the board," Bolinger wrote. "Martha Spears' (sic) endorsement of my opponent is of no significance and my record and endorsements speak very strongly for themselves." Spiers declined to comment on Bolinger or elaborate further on her endorsements for this article. While she understands that Bolinger "means this negatively," White considers it a "high compliment" that her opponent would say that Spiers considers her to be of a similar quality for the position. "Martha, a career-long social worker and current executive director of Oregon City's Volunteers in Medicine-Founder's Clinic, offering free medical care to the uninsured and underinsured, is dedicated to serving others," White wrote. "As a school board member, she is committed to the work of bringing our students safely and successfully into their futures. I am honored to have her endorsement." In addition to Storey, Bolinger is endorsed by Oregon City Mayor Dan Holladay, former City Commissioner Brian Shaw and OCSD Budget Committee member Shawn Dachtler. In addition to Spiers, White has endorsements from the unions representing local teachers and other school employees; the Planned Parenthood PAC of Oregon; the Working Families Party; County Commissioners Ken Humberston and Martha Schrader; and Clackamas Community College Board members Chris Groener, Dave Hunt and Irene Konev. White, a former Canby School Board member who said she volunteered for local schools weekly for 12 years while her kids were growing up there, is familiar to voters countywide for her unsuccessful 2018 attempt to unseat County Clerk Sherry Hall. Working in marketing for VNN Sports, Bolinger served on the OC School District Budget Committee before becoming a school board member. Last year he was appointed to return to the Budget Committee and to the Oregon City Parks and Recreation Advisory Committee. "I am confident that this community will join me in bringing our kids the best," Bolinger wrote. "They recognize that my opponent is new to Oregon City, lacks experience in this community and lacks the knowledge and experience needed to really have a powerful impact on the school board. She has only surfaced once since she lost in November and is just now making her presence known with local groups — all in an attempt to boost her campaign." White said she only met Bolinger this month at a homeowner's association meeting and found his behavior there "very dismissive." She acknowledged she's looking forward to a "new opportunity" to serve her community, however, she said, it just isn't true that she is seeking a school board seat for political reasons or that she lacks experience needed for the position. If she had been elected county clerk, it would have been her full-time paid job, but now she said she's volunteering for the unpaid school board position because she's passionate about serving local citizens in any way she can. White recently chose to "settle" in Oregon City by buying a home here and has more than 18 years of experience volunteering at many different levels in Clackamas County public schools. "Now that I am in a different phase in my life, I want to bring my love of community and my public education experience to work on behalf of my new — my chosen — hometown," she wrote. Bolinger said he was not surprised to hear that White described his behavior as "dismissive." Bolinger said White "continually interrupted" him during the presentation, and White returns the accusation that Bolinger himself talked out of turn. White was motived to run for the OC School Board out of concerns stemming from hearing about bullying and racist acts in the district. She was also disappointed by the process used by the incumbent school board to appoint Gwozdz's replacement without interviewing every candidate in an open meeting. White moved to OC from Canby in 2017 and says she's also "passionate about what is best for kids" after having five of her own who have graduated from public schools. She is the former development and communications director for the Oregon Citizens' Utility Board and Clackamas Women's Services. While she applauded OC's high graduation rates, she believes "we must not only offer strong programs in academics, tech and career training, and the arts, but also, the chance to be critical thinkers and creative innovators," White wrote in her Voters' Pamphlet statement. "I also believe that for kids to learn, they must be safe. The reality of today's world is that our school district must ensure that kids start the day with a full tummy; bullying does not hamper student learning; we deal openly with the racism still experienced in our system; both boys and girls understand 'consent' and healthy relationships. Safe students are successful." If elected, Bolinger said he would also prioritize advocacy for school environments in which every child can feel safe and accepted. "I work with local groups, families and individuals in public forums and privately to learn about individual challenges and ask for suggestions for improvement," he wrote in her Voters' Pamphlet statement. "It is this kind of personal care and interest that I will again bring to the board." Bolinger applied for appointment to the seat currently held by Remsburg to fill the term vacated by Siobhán O'Connor Gwozdz on Jan. 10, but Bolinger did not make it to the list of two finalists for the position out of 14 applicants. "It will be helpful to the board to have someone who knows the inner workings of the board, its policies and processes," Bolinger said in his application for appointment. "I have spent many years in the real estate and finance industry, giving me great insight that has been valuable to the board and the district in the past, and I am prepared to rely on that again." Anna Farmer, as a relative newcomer to Oregon City politics, has built a long list of endorsements in an effort to overcome Shelley McCoy's momentum as an OCSD Budget Committee member since 2014 and a resident of OCSD for 28 years. Each candidate for the position has two sons who have graduated or will soon graduate from local schools, and the race has been a comparatively less contentious one. "She has different experiences than I do, and I think it comes down to whomever the voters choose," McCoy said. In addition to Budget Committee service, McCoy has served as treasurer for the Yes for Oregon City Schools PAC, the OCHS Band booster group and the John McLoughlin PTSO. "I understand the importance of using funds in an efficient manner," McCoy said. "Sometimes this means making difficult choices, but I always strive to understand the issues and make an informed decision. The impact is not just numbers on a page, but the education of our kids." Farmer points out that she also works with finances in her day job and understands "fiscal responsibility and how choices today impact the long-range vision." A resident of the OCSD area for 18 years, she is a senior office administrator at a local brokerage firm creating long-term investment plans. "I am a strong advocate for equity, inclusion and diversity," Farmer said. "Not only am I proud of the equity statement our district adopted, there needs to be clear policies that create a culture of acceptance, and support an environment where every student feels safe enough to focus and learn." McCoy echoed Farmer's support for the equity resolution adopted by the board in 2017 and the need for the board to provide ongoing support for it in its policymaking. "Our kids deserve schools where they feel supported, safe and welcome while pursuing their dreams," she said. "Schools that are welcoming to all students and provide a variety of classes, programs, activities and sports allow kids to explore their interests and become engaged in their education. I know firsthand the importance of having schools where everyone feels they belong." Farmer has been active volunteering in local schools throughout her sons' education and has received the endorsement of the local teacher's union through the Oregon City Education Association and the local chapter of the Oregon School Employees Association. McCoy said she wasn't contacted by either union to be interviewed for an endorsement, but she has deliberately not sought out endorsements from other school board members besides Storey. "Going forward it's important that the board works well together and can collaborate well together," McCoy said. "My endorsements … show that I am respected in the community for the work I've done," Farmer said. "It reflects their confidence in my ability to work with existing policymakers, and have a strong network of informed leaders supporting my efforts to strengthen the school district." When her children were young, attending local schools since 2005, Farmer ran a "disability-inclusive child care" facility from her home. Farmer noted she still keeps in touch with those children who now are students in OCSD. "I have a unique view into their challenges connecting with services," she said. Farmer has worked to overcome challenges for local homeless students, and she helped begin the Sheltering Our Neighbors program, a temporary overnight homeless shelter partnering with NW Housing Alternatives, Clackamas County Social Services and numerous churches.